The other week, we covered general terms that teachers say in parent-teacher conferences. Oftentimes the terms used in parent-teacher conferences aren't common, everyday words, they are educational jargon! As a result, parents are left feeling confused; wondering what was said and what it means for the educational future of their child. 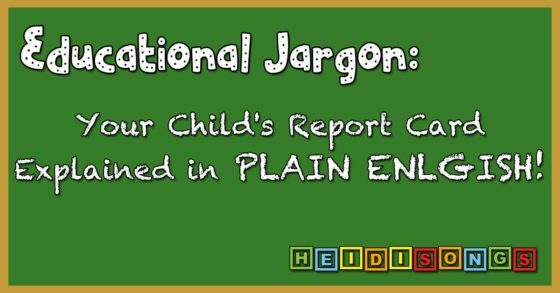 This week we'll guide you through Language Arts Terms and Math Terms that teachers use and that appear on report cards -- taking that educational jargon and turning it into plain, everyday English. This is simply the ability to see the difference between shapes, numbers, and letters. Often, children's vision is not yet fully developed when they start school, and therefore they have not yet developed visual discrimination. That means that if they look at an O and a Q, they may not see any significant difference. They may tell you that both letters are exactly the same. They may also see the letters p, q, b, and d to be exactly the same thing and copy them backwards. 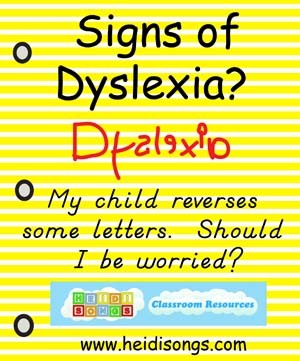 Teachers call these "reversals" because the letters are reversed. Reversals are pretty normal in Kindergarten! For more information on this, click here. Children need to be taught to look for the differences between each of the symbols they see so that they can start to learn to identify them. If your child doesn't outgrow this problem by the time they are halfway through Kindergarten, have your child's eyes checked by a physician! For some great resources to help your child practice visual discrimination, click here. 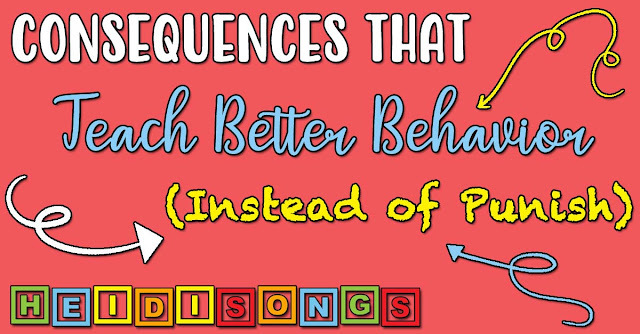 Phonemic awareness is an awareness of sounds, and the ability to play with the sounds of language and change them around to make new words and even make nonsensical words! Phonemic awareness is not the same as phonics! Phonics is all written down, but phonemic awareness instruction is all done by speaking and listening. This makes it hard for many children that have not yet developed good listening skills, because they are used to having something to look at that will hold their attention (like a television set!). Phonemic awareness instruction has become very important in the world of reading instruction over the last ten years or so, since researchers have become more aware of its effect on children's ability to read and write. One thing that phonemic awareness instruction does is help children learn to tell the difference between sounds. For example, children should hear the difference between the sound of a /b/ and a /p/ when they hear them, so when it comes time to read or write those letters, they know the difference. And when children learn to pull words apart and put them back together again, they become aware of every single sound in the words that they hear. Therefore, they are better able to write the words without skipping letters and sounds that they should realize are there. Children that learn to blend three sounds together to form a word, and that can do this without looking at any letter cards, are much more likely to be able to read those words when they see them in print. - Rhyme: Rhyming words have the same middle and ending sounds, although they do not always share the same middle and ending spellings. (Ex. cat/ hat, bug/rug, threw/ blue). For some resources on practicing rhyme with your child, click here! This may all sound the same to the non-educator’s ear, but the skills are different and they build on one another! *Recognizing rhyming words: This is the lowest level skill in the category of rhyming words. To do this, all you have to do is ask a child, “What rhymes? Is it “cat/ hat,” “cat/ pig” or “cat/dog?” We always showed the kids pictures while we did this, and pointed to them. Then the children only had to point to the word that rhymed with the first one. So, a verbal response was not even required. *Identifying rhyming words: This is the next step up in the category of rhyming words. The children have to match up cards with pairs of rhyming words on them after being told what the pictures represent (so they don’t have to guess at the names of the pictures on the cards.) Then the children must tell the teacher the pairs of rhyming words. *Producing rhyming words: This is the highest and hardest level of the skill of rhyming. All you have to do is tell the child a word, and he or she must tell you another word that rhymes with it. My district gave credit for nonsense words, so if a child was given the word “cat” and said “lat,” that counted as correct. - Identifying beginning sounds in words: This means that the child can tell you what single SOUND the word starts with. (Ex. The word cat starts with the sound of the letter C, which would be written /c/.) This is not the same as telling the first LETTER in the word! Check our website for some resources for identifying beginning sounds in words here! - Sound substitution: In this skill children are given a word and asked to take one sound off and put on a new one to make a new word. It can be tricky, especially since it is all oral! - Sound blending: This skill is like the blending skill mentioned above, but is usually done with two or three sounds put together to make a word. (Ex. /p/ + /i/ + /g/ = pig) Check our website for lots of great sound blending resources here! - Syllable counting: In this skill children are supposed to count the parts of a given word (syllables). Example: run (one syllable), walking (two syllables), elephant (three syllables), alligator, (four syllables.) The trouble is that children often confuse segmenting a word with syllable counting, so they might say “/r/ /u/ /n/” rather than “run” and count three sounds rather than one syllable. So the key is to get them to really focus on the directions and listen to what is being asked of them. Fluency in reading refers to speed in reading, and ease of reading. It also includes the intonation or the tone of voice when one is reading. So, how do you sound when reading aloud? Does it sound like you understand what you are reading? Fluency is important because children who read more quickly are more likely to understand what they have read. We used to call this non-fiction! Informational text is any kind of book, pamphlet, or magazine that you can use to get information from. The Common Core State Standards say that children should be reading much more of this than they usually do and get used to it, because when they get to the higher grades, they mostly just have to read text books for information and learn to understand it. The DIBELS tests are not given everywhere, but they are given in many schools all over the United States. DIBELS stands for Dynamic Indicators of Basic Early Literacy Skills, and it was developed by the University of Oregon. The DIBELS tests are usually timed, very short tests that are used to predict which children may be likely to have trouble in the future with literacy skills such as reading and writing. The problem with the DIBELS tests is that they go SO fast that if the children are not listening closely to the instructions when they are given, they could miss the whole thing in one minute flat! And those that give the tests are not allowed to repeat the instructions. Children that might not be feeling very cooperative on the day the test is given may surprise their parents and teachers with some very low scores that don’t seem to make sense when compared to their daily achievement. These are the letters that do not have any sounds that “stop” in them, such as A, E, I, O, and U. Sometimes Y and W are also considered vowels. Consonants are all of the rest of the letters that are not vowels! Check our website for resources for helping kids learn the alphabet here! 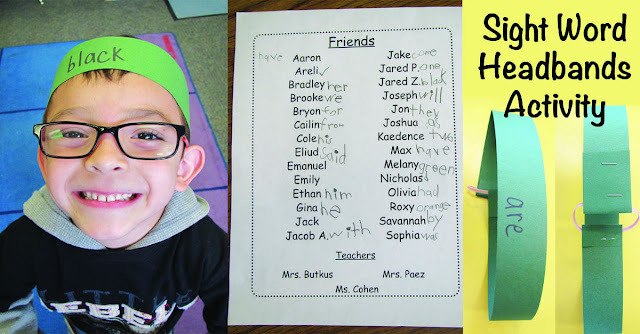 Most teachers in pre-k and kindergarten ask their students to try to sound out new words that they are trying to write and spell them as they sound. Most children start out by simply writing the beginning and perhaps the ending sounds. After that, the vowel and other middle sounds begin to appear. This is called "developmental spelling" and it is perfectly normal! If your child's teacher asks you to have your child write a word like it sounds on homework, she is not expecting you to spell for your child. In fact, that is the worst possible thing you can do for your child! Insist that your child say the word aloud and then write any sounds he or she hears. Otherwise, the child will probably continue to insist that the teacher also spell for her every time she needs a word. Many children will refuse to write ANYTHING unless the teacher spells it for them, and this is NOT what we want! First they learn to listen for the sounds, and spell words as they sound. After that, they start to transition into conventional spelling as they become real readers and writers. Phonics instruction got a bad rap a few years ago as some children never learned to transition OUT of writing everything as it sounds. Spelling instruction, (and insisting that children actually USE their spelling skills that they have learned in their writing!) must go hand in hand. Phonics is a set of “rules” for teaching children to sound out words in print. Phonics includes such rules such as, “When two vowels go walking, the first one does the talking,” as in the words “wait,” and “coat.” Another phonics rule is the “Bossy E” rule, in which the “Bossy E” at the end of the word makes the middle vowel make the long sound (say the name of the vowel) rather than the short sound, as in words like “cake” and “bike.” Check our website for lots of great phonics resources here! Short vowel sounds are the “other” sounds that each vowel makes in those very short words, such as “pig,” “cat,” “met,” “pot,” and “cut.” These are usually considered the primary sounds of each of these letters. Parents should be very careful in teaching their children these sounds correctly, because once a child learns the incorrect sound, it is very hard to correct! And an incorrect sound will produce the wrong word when a child sounds it out. A CVC word is a word that starts with a consonant, has a vowel in the middle, and then ends with a consonant. Hence the name, CVC (consonant-vowel-consonant.) Beginning readers often start by reading CVC words because they are often the easiest to read, given that they usually don’t have any tricky phonics rules to apply to them. 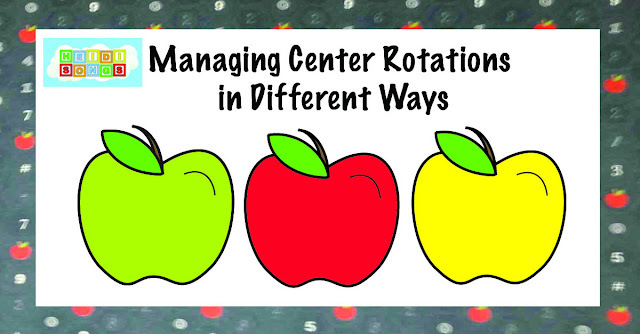 Check our website for lots of great resources for sounding out these three letter words here! These are words that are used often in print and usually cannot be sounded like "the," "of," and "said." Because they cannot be sounded out, they must be memorized. Check our website for lots of great sight word resources here! A numeral is a number written down. If your child knows his numerals, he knows that this (5) is a five. But he may not know that it represents five objects. For resources to help your child learn the numerals (numbers!) click here. This is a fancy way of saying that children are supposed to be able to look at a group of objects and quickly guess at how many there are without counting them. Children can usually learn to do this more easily if they get used to the arrangements of dots on dice and learn to recognize how many there are without physically counting the dots one by one. Putting dots on ten frames is another way to help kids subitize or make a smart guess as to how many there are without counting. Fluency in math just means that children are supposed to memorize the answers and be able to tell them quickly without having to count with their fingers or anything else. So if you want a child to achieve fluency in math facts, then you are saying that you want him or her to memorize the answers to addition and subtraction problems such as 2+3 or 7-3 so that they can do them very quickly. If the teacher wants the child to "achieve math fact fluency to 5," then the child only has to know the addition problems that add up to answers no greater than five. So that means that your child wouldn't need to practice problems like 5+3, because that equals eight, and eight is a larger number than five. For resources to help your child learn the basic addition facts to ten, click here. It is likely that the teacher also wants the child to know the corresponding subtraction facts as well, so then starting with five or less, subtract from there. Examples: 5-4, 5-3, 4-2, 3-1, etc. The first number in the equation should not be greater than five. Therefore, you would not need to practice a problem such as 6-3, because the first number in that subtraction problem is already greater than five. Ten frames are used to help children subitize numbers. A ten frame is a chart with five squares on one side and five on another for a total of ten squares. Children are taught to recognize that if one side is full of dots, there are five. If both sides are full, there are ten. If both sides are full, except for one spot, then that is ten minus one, or nine. If one side is full, plus there is one more on the other side, then it is five plus one, or six. You can find free downloadable Ten Frames on this post, here! This is a ten frame that shows nine objects. Children are supposed to see immediately that there are nine dots, because there are ten spots total, and one is not filled in. Therefore, 10 minus one equals nine.